Happy Friday everyone! Another fun find coming your way today! We have several family members and friends who have to eat a gluten free diet. I am in total awe of them. I can't imagine having to eliminate it from my meals. I also applaud the work that goes into special recipes and the sacrifices that are made for their health or health of their family. I've been told that it gets easier over time which is fantastic! The list of "gluten free" recipes, menu items at restaurants and various food products is only growing. That's why I was so excited to discover another gluten free bakery here in Tucson called Got2B Gluten Free. 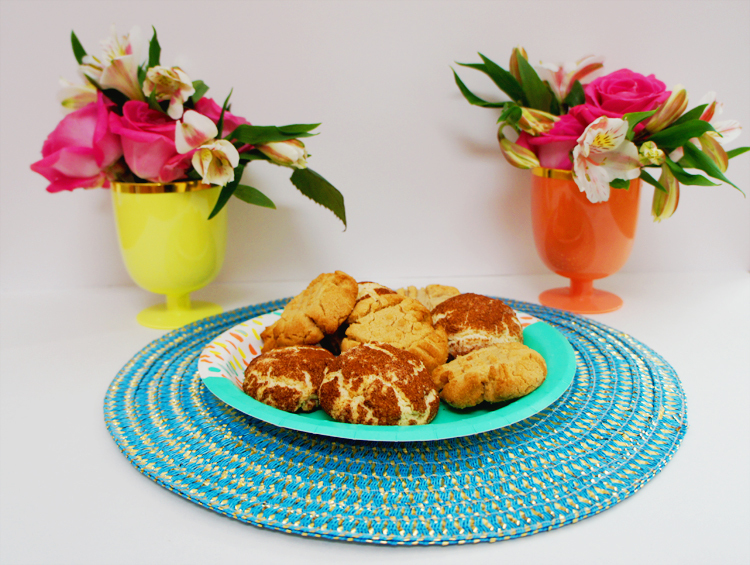 Our whole family enjoyed an assortment of cookies, coffee cake, and blueberry muffins. So to all my gluten free friends...You need to check this place out! The muffins and coffee cake were consumed within a few days but I managed to snap some pictures of the peanut butter cookies and the snicker doodles. The muffins were moist and the blueberries tasted fresh. Peter and James gave them a stamp of approval. My personal favorite was the coffee cake. The toping was sweet and crumbly! My first bite was followed by shouting to Andrew "This is amazing!" (see mouth full of cake). Peter also enjoyed the cake. Hence...the face plant into my plate. Nobody has time for forks! What? Doesn't everyone consume large amounts of cookies next to goblets filled with flowers? No? Oh ok. Well to all my gluten free friends out there...This is for you! I hope you enjoy!